Want to be notified of new releases in ameeno/Dell-E7440-Hackintosh? Use High sierra or Mojave. To use: Simply Download the repository as a Zip file and extract to your EFI partition under the EFI Folder. DO THIS AFTER YOU HAVE ALREADY GOT A BOOTABLE CLOVER EFI INSTALLED otherwise you must set your laptop to boot from clover in the Bios. I will link a guide on how to do this in the future. BTW, inside the kext/Other/CopytoLE folder, copy these kexts into /Library/Extensions on your Hack. This guide references a few other guides. Credit for those guides is given to their respective owners. Special thanks to evy0311 and his guide Here on how to configure the t440p for a hackintosh install. Also a special thanks to midi1996 on GitHub for his guide on how to create the macOS installer from Recovery. I used this guide to do an esiaer writeup for this laptop, especially the building your OSX installer Bit. Note: I am currently working on a fix for the items listed above. If you use this guide and information and find that something does not work, please submit an issue request so I can work on a fix. Since I don't have access to a legitimate Mac, I needed to be able to create a vanilla macOS installer. This guide (and many others) used to inform users to create a USB installer for a macOS Distro such as Niresh. While this may work just fine for then creating a vanilla macOS installer, distro's can be (and are) very shady. They come preloaded with a bunch of extra junk that is not needed, and just overall are highly advised against being used. Follow the steps below to figure out how to create a REAL macOS Mojave Vanilla installer without having access to a real Mac. Follow the steps at this guide Here. IMPORTANT (DO NOT MISS THIS): Now, copy Clover bootloader and the kexts files that you have downloaded to another USB drive (not the one you're burning the installer too) or an external hard drive. You will need access to them later. Copy the CLOVER & BOOT folder's you have downloaded from this repository onto your USB drive as well. Copy the CLOVER folder you have downloaded from this repository into EFI/. You can simply copy over the whole folder as the config.plist and everything else is already configured for the E7440/E7240. For more help on configuring Clover and the USB installer, the original guide linked in step 1 will be of the most help to you. Make sure you install the kexts and CLOVER folder from this repo onto your Clover USB, as these will guarantee your E7440/E7240 will work properly. We are now ready to continue into the next topic: Installing macOS Mojave. After you followed the guide above and have your USB drive ready to go, we can reboot the machine. When you reboot, enter into the BIOS to change some settings. On the E7440/E7240, you can do this by hitting F12 at the Dell boot screen and choosing BIOS Setup. Once in the BIOS, make sure you change the following settings. Disable Security Chip, Disable Anti Theft Module, and Disable TPM. Basically, disable all of the "security" features. Make sure Secure boot and other features like that are off. These features will affect how macOS sleeps, Choose UEFI and Legacy Boot. Now, reboot into macOS and press F12 select the USB drive inside of Clover. 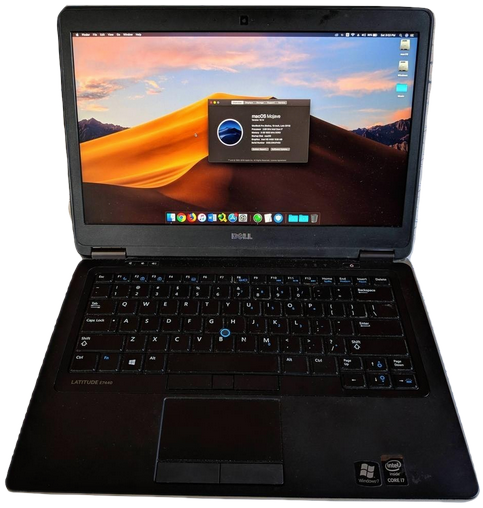 Boot into macOS and install onto your hard drive using Ethernet/Wifi from recovery. I recommend using an SSD. After this is done, reboot the computer and let it sit. Mine rebooted a few times on its own to go through some final installation procedures. Once you see the "region selection" screen, you are good to proceed. Create your user account and everything else, but do not sign in with your iCloud account. If it asks you to connect to a network, select the option that says do not connect and press continue. We will connect it later. After you've booted, plug in the USB drive or external hard drive that you copied the Clover file to in step 9 of the previous section. Install Clover bootloader following the same steps as before and using the same settings, except this time install them onto your internal hard drive with your Mojave installation. I recommend checking the box that says Install Clover Configurator as well (it comes in handy later). We now need to copy our Clover configuration from our USB to our hard drive with Mojave. Simply copy the CLOVER folder and EFI folder in this repo into the EFI partition that Clover should have mounted during install. Inside the Clover/kext/Other/CopytoLE folder, there are several Kexts which you should copy to your /Library/Extensions folder on your hackintosh. I recomend you use clover configurator to setup your own serial Number and MLB/UUID's to make them unique to you. This can be done easily using clover configurator. Finally, run the included permission-E7440.sh file to repair permisions and fix up your system hibernation. If you have a full HD (1920x1080) screen (stock or modded), it is recommended that you install One Key HiDPI. This will mimic the "retina" display feature that many of Apple's newer laptops come with. I highly recommend following This guide to get these features working. It worked for me on the first try and was super straight forward compared to other guides that I have seen before in the past.